GLOBAL - At Petersime, we believe we should use nature as a reference to build incubators and develop technology. A mother hen instinctively knows which conditions her eggs or hatchlings require to optimise their welfare and performance. We believe we should replicate these conditions in the best possible way. Taking this philosophy as a guideline, we bring forward a series of articles related to using nature as a reference to optimise welfare and performance. Sit back, relax, and get caught up in Steve Evans’ observations on the natural instinct to subsist on the remaining yolk sack. The Red Junglefowl – a species wherein the instincts of ancestors still run strongly in its blood – may teach us some basic knowledge about incubation. We made some very important observations by studying nature, such as the mother hen encouraging her chickens to subsist on their yolk sack reserves. 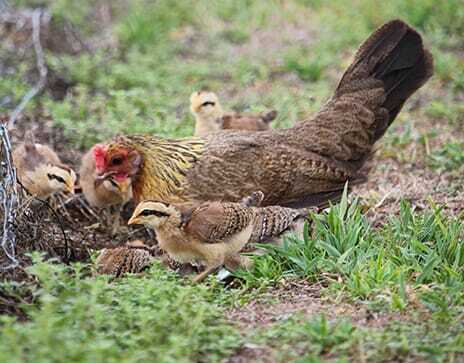 It has been an observation of mine during my forty years in the poultry industry that a basic knowledge of the behaviours and instincts of the native hen is being lost. This has come as an unforeseen consequence of the strict – and absolutely essential, I should add – bio-security rules being implemented around intensively farmed poultry. One of the first selection criteria for staff being employed to work in the intensive poultry industry is that they do not keep poultry of their own. This means that people progressing through the intensive poultry industry only learn from their experiences and observations gleaned within that industry. I believe that it is a widely accepted fact that much inspiration for the intensive industry comes from imitating the native hen. Nature has set out the ground rules. The intensive industry pushes the boundaries. However, with this disassociation with basic, natural poultry knowledge, we have to a certain extent lost the ability to discern the difference between fact and fiction. I have often listened to industry experts, for whom experience was only gained within the confines of intensive farming, speak with great conviction about the behaviours and instincts of the native hen while being very far from accurate. In this article I want to explore this observation specifically in relation to incubation. However, before I progress any further, I believe it behoving of me to supply a little background that justifies my standpoint. I was very fortunate to grow up on a farm on the outskirts of Sydney, Australia, that my father ran as a breed preservation centre for some of the lesser known and endangered varieties of poultry such as Silver Grey Dorkings, Faverolles, Andalusians and Langshans. Large numbers of visitors passed through the farm every weekend, many of them returning home with a sample of whichever breed of poultry had most appealed to their fancy. At its peak, the farm helped preserve over thirty different varieties of poultry in both their large and bantam form as well as ducks, geese, turkeys, pheasants and peafowl. It was a wonderful environment in which to develop a sound knowledge of fundamental poultry farming practice. Five years ago, I became involved in a loosely formed programme to help preserve the remnant Red Junglefowl genetics in Australia. The Red Junglefowl is the original chicken native to South East Asia, from which all modern day varieties of chicken are descended. The last imports of Red Junglefowl into Australia took place prior to 1952 before the government closed the country’s borders to prevent the introduction of diseases that were impacting agriculture elsewhere. Red Junglefowl in Australia had been largely a bird for fauna parks and zoos as they possessed very little commercial value. As such, they tended to breed indiscriminately and without any management of preserving bloodlines for the long term. When I became involved, there was very little knowledge in relation to pedigrees and there were tell-tale signs of interbreeding – the diminishment of sexual dimorphism for example. We assembled breeding flocks with the birds available and set about a plan for keeping future generations healthy and viable. Initially, the plan was to collect eggs daily, store for up to a week and then hatch them artificially in incubators. And this has indeed been a practice carried out every year since. But the Red Junglefowl has the instincts of her ancestors running strongly in her blood and her primary desire is to lay a clutch of eggs, hatch them herself and then rear the offspring. This is her most passionate desire and faced with the prospect of having her eggs removed for artificial incubation, she becomes cunning in her methods to hide her eggs from detection and keep them for herself. Before we knew it, we had numerous hens sitting broody in various concealments and the decision was made to leave them be. Once we knew that this was occurring, we paid more attention to the habits of the hens as they prepared their nests for incubation. A nest was never larger than twelve eggs. The hen laid a single egg each day until her clutch was complete. Eggs were laid at a similar time of the day, generally in the early morning. The hen would only visit the nest if she believed that she was doing so unobserved. She would sit on the nest for up to an hour while she waited for that day’s egg to be laid. In so doing, she was effectively pre-incubating all of the eggs for an hour every day. Once the clutch was complete, the hen would commence incubating her eggs. For the first week she was rarely observed away from her nest, instead sitting very tightly. The attentiveness of the broody hen to her nest during this period was particularly impressive. You could be inadvertently on the verge of stepping on a broody hen and she would not move a muscle. Nests were predominantly at ground level and we observed that nests on the soil were more productive than nests on timber or wood shavings. The assumption here was that a nest over the top of soil afforded the hen greater opportunity to control the environment around her eggs. During the second week of incubation the hen could be observed to leave the nest every morning to eat, drink and defecate. Nevertheless, this period away from the nest was minimal. In some but not all cases the hen covered her nest with feathers and other nest material to make the eggs less visible. Whilst in attendance of the nest, the hen appeared to sit more lightly on her eggs, raising her body slightly. As hatching approached, the hen’s demeanour returned to what it had been during the first week. The hen’s attentiveness to the nest at time of hatching was particularly interesting. The first evidence of hatching might be a fragment of broken shell protruding from beneath the hen’s body, or a chicken’s head poking out from among her feathers. During the entire process the hen invariably remained tightly in attendance of her nest. If she were interrupted, she would exhibit an aggressive pose of fluffed out feathers to appear larger, but only leave the nest with utter reluctance. Our observation was that the hen was quite content for early hatching chickens to subsist on their yolk sack reserves for up to two days. She remained assiduously attached to the nest until her very last chicken had fully extracted itself. Chickens were invariably alert and healthy with perfectly healed navels. In many instances, once we knew that the hatching was complete, we removed the hen and her chickens to more secure lodgings. These lodgings were furnished with clean drinking water and a source of commercial chick starter crumbles. It was at this time that one of our most interesting observations was made. 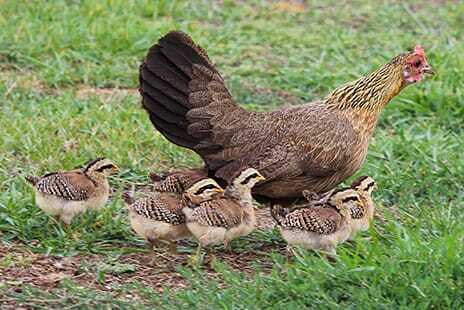 The hen of course differs from other varieties of bird such as pigeons, parrots, birds of prey, etc. in that she cannot physically feed her offspring but instead must teach them to find and consume food for themselves. Interestingly, what we observed was that the hen did not encourage her chickens to take the supplied feed. Instead of this, she would scratch amongst the floor litter and vocalize to encourage the chickens to peck. We observed that the chickens would eat food of very little if any nutritional value. From this we concluded that the hen was merely encouraging the chickens to activate their gut processes while they were still subsisting on their remaining yolk sack. There was therefore the very real potential for a chicken to exist four days on its yolk sack before consuming any food of nutritional value. I must reiterate at this point that these chickens were slow-growing Junglefowl – nothing in comparison to our modern-day commercial meat chickens in size and growth potential. Nevertheless, parallels can still be drawn in relation to phases of incubation and early feeding. Steve Evans has worked for one of Australia’s largest intensive poultry farming integrations and now operates a free range farming enterprise of his own. He is also consultant for Petersime.